The International Trumpet Guild announces a call for submissions of new compositions for trumpet to be performed at the “New Works Recital” at the 2016 International Trumpet Guild Conference in Anaheim, California. Check this new Video Report from the early days of the ITG Conference. It features clips of several performing groups throughout Tuesday and Wednesday! Photos from Tuesday and Wednesday of the 2015 ITG Conference in Columbus, Ohio are now online! Conference web streaming starts at 11:15 today! Live Web Streaming Tuesday evening and all day Wednesday! As a part of the continuing Conference Coverage, ITG will publish many photos and reports of the events within 24 hours of the events happening. Please check the ITG Conference Coverage page often! IN MEMORIAM is a phrase that has been repeated so many times this year. ITG’s 40th Anniversary Conference (Columbus Ohio, May 26-30) celebrates a Living Legacy. Much of that living legacy relies on the legacies left by those who have already passed. Not only will a number of artists dedicate some of their performances to individuals during concerts and recitals, a special In Memoriam session has been scheduled for 1:30pm, Friday May 29. * Terms begin in October, 2015. Thanks to all who voted! The Conference Artist Committee invites ideas for presentations at the 2016 ITG Conference, to take place in Anaheim, California from May 31 to June 4, 2016. Proposals for specific lecture-recitals, non-performance presentations, and master classes may be submitted. Send proposal with supporting materials, including a brief paragraph that provides details for the presentation, to: Dr. Richard Birkemeier, 2016 Conference Artist Chair, at [email protected]. Deadline is July 1, 2015. ITG 2015 Meet The Artist Videos! 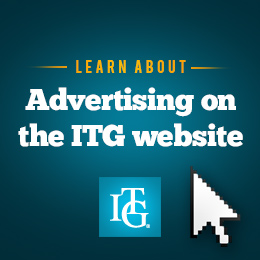 Welcome to ITG's New Website!